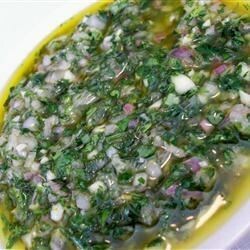 "This is the simplest way to make authentic Argentinean chimichurri. The greatest thing about authentic Argentinean food is that it is easy to make and hard to screw up!" Stir olive oil and lemon juice together with garlic, shallot, parsley, basil, thyme, and oregano; season to taste with salt and pepper. Allow to stand for 2 hours at room temperature before serving; store remaining chimichurri in refrigerator. Easy Argentinian sauce for grilled meat and vegetables! so easy! i threw everything in the food processor and it was so delicious.. though next time i might cut back a little on the lemon, it was a bit sour! Yum! I'm no expert on chimichurri, so I won't even pretend to be. I am, however, somewhat of an expert on deliciousness - and this has it. Thanks! So delicious - you can put it on ANY meat. And I like to freeze it in ice cube trays (like pesto) then you can take out single servings when you want. Delicious! I served this with grilled steaks. This was a great way to utilize some of the herbs from my garden. Thanks for this recipe! We love this stuff and eat it on pretty much everything.